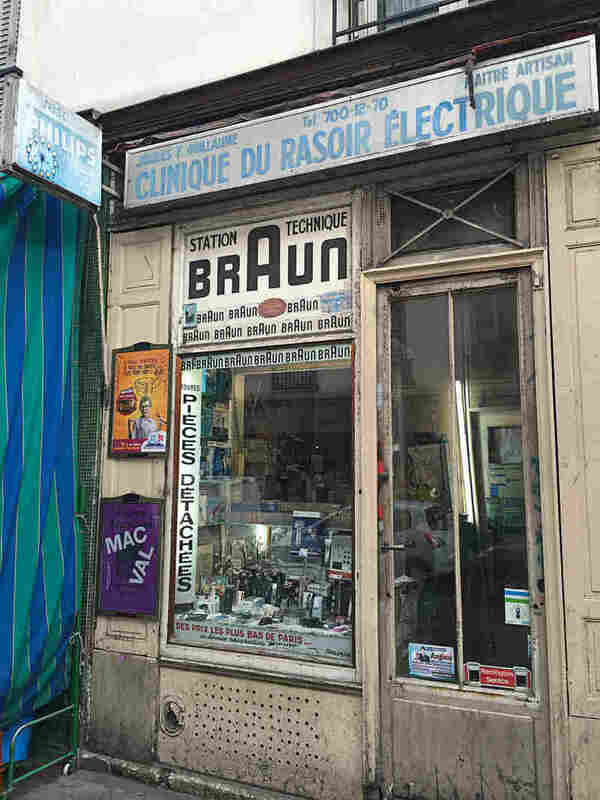 The Last Electric Razor Repairman In Paris : Parallels In a tiny shop from a bygone era, Jacques Guillaume gets calls about more than razors because there's nobody to fix things anymore. "Today, manual work like this is passé and obsolete," he says. On an ordinary day, you might miss this slip of a shop wedged between a veterinary clinic and a grocery store in Paris' popular Bastille neighborhood. But on an empty August afternoon, the Clinique du Rasoir Electrique — the Electric Razor Clinic — jumps right out at me. 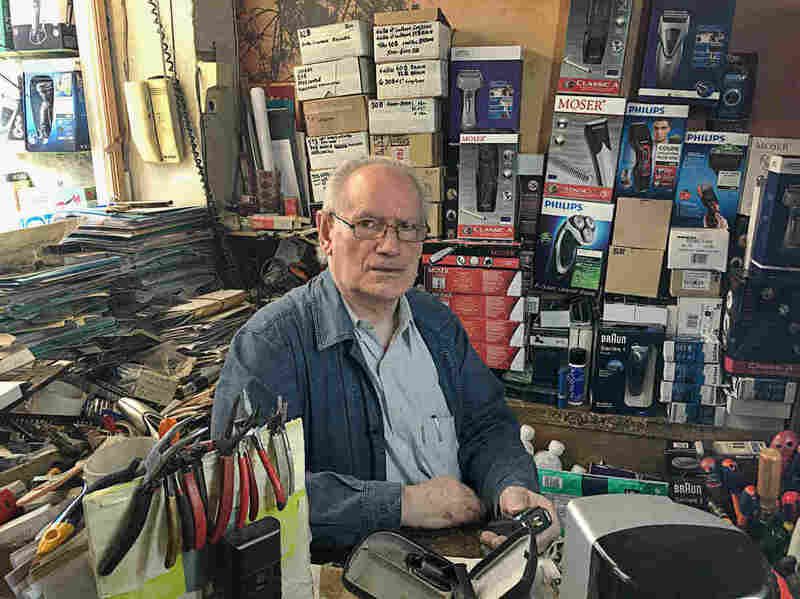 Here, in a cluttered shop from a bygone era, 73-year-old Jacques Guillaume has been repairing electric razors since 1962. He says he's the last of a kind. "Today, manual work like this is passé and obsolete," he says. "Before, there were shops that repaired dolls and fountain pens and all sorts of things. All the way up into the 1970s. But now there are very few of us left." Guillaume may well be the last electric razor repairman in Paris. He says the popularity of electric razors, which were invented in the 1920s, really took off in the 1960s. Guillaume saw a niche. He was just 20 and was looking for work. He'd been told he was good with his hands. He says business was really booming in those days. These days, people tend to send him razors to fix in the mail — from all around France. He's even gotten a few from abroad. Guillaume set up his Electric Razor Clinic in Paris' popular Bastille neighborhood 50 years ago. It's valuable real estate now but he has no intention of selling his shop. Today, he's working on a vintage Sunbeam razor from the 1960s. He says that was a good, solid American brand. But it doesn't exist anymore. I ask him why people want to fix old razors. "Because they may have sentimental value or because they're just good razors," he says. "Today razors may look good and flashy, but they're cheap. And they're all made in China even if they say 'made in Germany.' "
Since Guillaume's been sitting in this spot for the last 50 years, I ask him what's changed about Paris. He says the city was so different before. "People were more connected with each other and there was a certain civility that we don't even imagine today," he says. For example, if a man went out shopping, he wouldn't think of coming home without a bouquet of flowers for his wife. Guillaume lives with his wife across the street. He still closes his shop every day to go home for lunch. A call comes from someone asking if Guillaume can repair a toaster. (He tells them he probably can't.) He says he gets calls like this to fix all manner of appliances. "People are forced to throw things out," he says, "because there's no one who repairs stuff anymore." Guillaume says he gets about seven customers a day — except in August, of course, when most Parisians are away for summer holidays. Guillaume feels vacations aren't the same as they once were, either. "It used to be you made a real break," he says with a sigh. "You shut the door and left. But now people are always connected to their smartphones. So they take their worries with them." The septuagenarian knows he's sitting on prime real estate. He says people come in wanting to buy his shop just about every week. "I tell them to come back in 20 years," he says. "I might not be here, but we'll see." Guillaume says contact with people keeps him intellectually fit and connected. He has no intention of retiring. "When you stop working, you just think about yourself," he says. "And that's the beginning of the end."